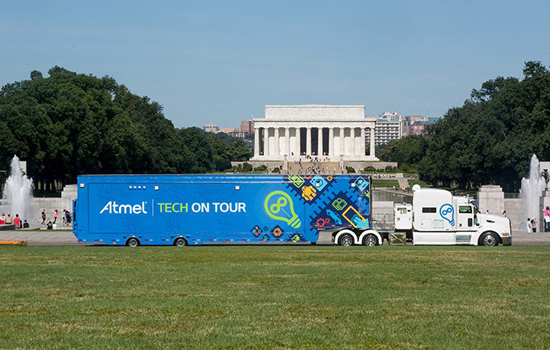 The Atmel Tech on Tour rig will be at RIT on Sept. 18. Engineers with the company will demonstrate current embedded systems technology and lead workshops for students, faculty and area professionals. Rochester Institute of Technology will be one of the upstate New York stops on the Atmel “Tech on Tour” event, taking place on the campus from 8 a.m. to 5 p.m. on Friday, Sept. 18. The event is free and open to engineering, science and technology faculty and students at RIT as well as regional engineering professionals. A 40-by 85-foot tractor-trailer, set up with current embedded systems technology from Atmel for wireless systems, wearable devices, 3D printers and touch-screen sensors, will be located in H Lot on the RIT campus. Atmel staff will lead demonstrations and hands-on training classes in use of its systems throughout the day. Demonstrations will include how embedded systems are being used in automotive and transportation applications, robotics, electronic devices and gaming systems, and alternative energy—and integrated together as part of the growing Internet of Things. Student sessions will take place from 1 to 4 p.m., with specific seminars at 1:15 p.m. and 2:45 p.m. about Atmel microcontrollers used in Arduino boards, Atmel Studio IDE development software tools and Arduino Sketch tools. Participants can register online for the sessions. The event is sponsored by RIT’s Kate Gleason College of Engineering and its computer engineering department. Atmel develops and produces microcontrollers, mixed signal, nonvolatile memory and radio frequency components for consumer, industrial and government systems.